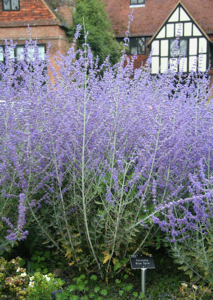 This plant, commonly known as ‘Russian Sage’ is technically known as a sub-shrub, as it grows from a woody base. This is a plant that thrives in hot sunny borders with well-drained soil and it’s always a very welcome sight in midsummer which can be a difficult time to find colour in the garden – the early flowers are over and the later autumn flowering plants aren’t quite at their best yet. To succeed with Perovskia, you should prune plants in late spring when they are starting to put on growth, rather than cutting back in autumn. You’ll then be rewarded with upright silvery grey stems with fragrant leaves and lovely violet flowers in late summer. The best known Perovskia is probably ‘Blue Spire’ which reaches 1m in height, but I also use ‘Little Spire’ which as the name suggests is a smaller variety, reaching 60-80cm in height as a rule. For maximum impact, grow them in groups. This is one of those really long-flowering perennials I seem to include in pretty much every garden I plant! I’m always looking for reliable, great value plants and this particular hardy Geranium is invaluable. No kidding, it flowers from June to October or even into November, and there aren’t that many reliable plants that can offer that sort of flowering period! It’s fast-growing and spreading (up to 1 metre wide), forming a wide clump of foliage which is great to smother weeds, and its large blue flowers are held on stems above the mound of leaves. Fine in sun or some shade, not fussy about soil type and generally very easy to grow. 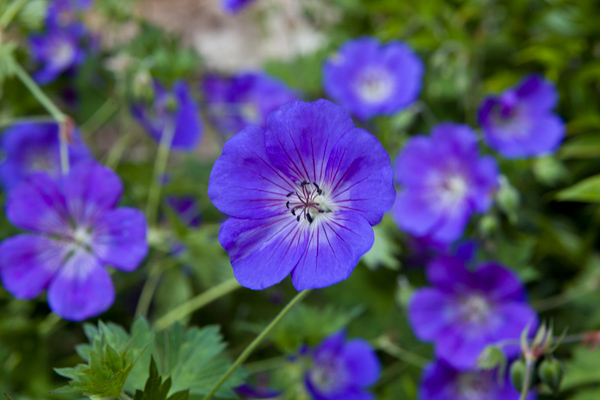 Hardly surprising Geranium Rozanne was named ‘Plant of the Centenary’ at the RHS Chelsea Flower Show 2013! 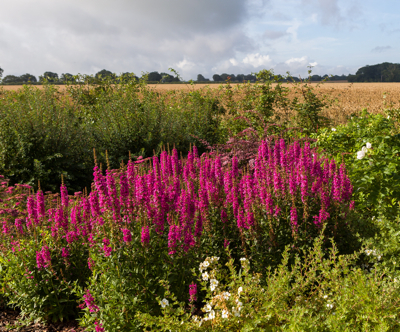 This ‘loosestrife’ is another long-flowering perennial which provides a real splash of colour in midsummer, and will attract lots of insects in search of nectar, so it’s great if you’re interested in planting for wildlife. Flowering from July to September Lythrum ‘Robert’ has dense upright spikes of deep pink flowers and reaches about 75cm in height. It will grow in some shade, but Lythrums do need a reasonable amount of moisture in the soil to thrive. In fact most Lythrums are ideal for bog gardens and to grow as marginal plants next to water. ‘Robert’ though, is alleged to be more tolerant of slightly drier conditions than other Lythrums and I have grown it successfully in the garden above, which has fairly water-retentive soil but is far from being classed as boggy. 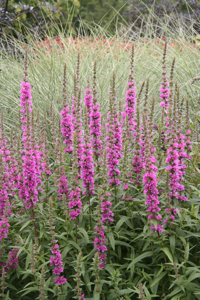 A slightly taller variety is the reliable Lythrum salicaria ‘Feuerkerze’ AGM (Award of Garden Merit from the RHS). It gets to about 90cm high and about 45cm wide, so all in all a slightly larger variety than ‘Robert’. 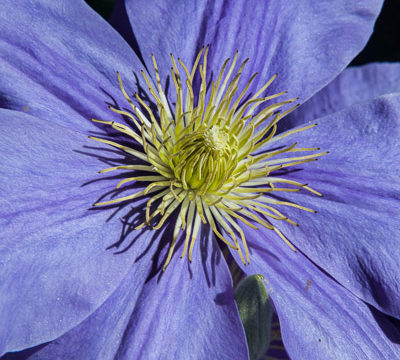 This is a very easy two tone purple Clematis which will tolerate some shade and isn’t too fussy about soil conditions. Flowering from July to September and reaching up to about 3 metres in height, it’s great to climb up trees and scramble through shrubs which have finished flowering and could do with a bit of extra colour at this time of year. It’s not so big that it will get out of control and is such a good plant it’s been awarded the RHS Award of Garden Merit. 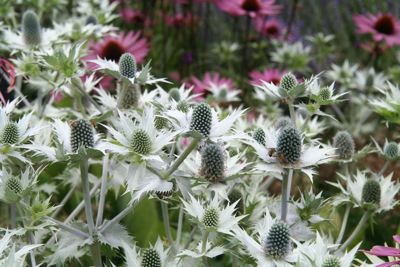 Eryngium (or ‘sea hollies’) are great plants for dry sunny gardens with poor soil, where they will thrive. 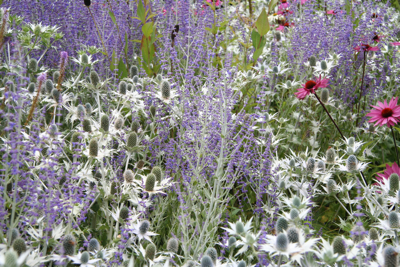 They look fantastic with grasses and plants like Lavender, Perovskia and Nepeta which like similar conditions. But they are not only valuable for the fact that they will grow where many other plants won’t, but because they offer such a long season of interest, having a beautiful architectural form which lasts long in to the winter. There are many varieties of Eryngium, and ‘Silver Ghost’ is a biennial (which means it flowers in its second year and then dies after setting seed). 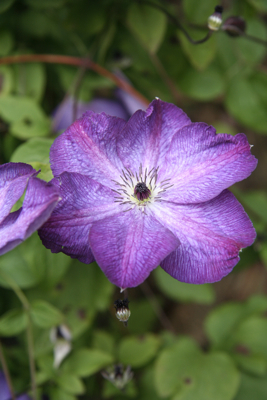 The flowers turn blue as they mature and can be dried for flower arranging. Many other Eryngiums are perennial and it’s worth growing a mix of varieties for different flower forms, heights, and shades of blue and silver – if you have the right conditions in your garden.